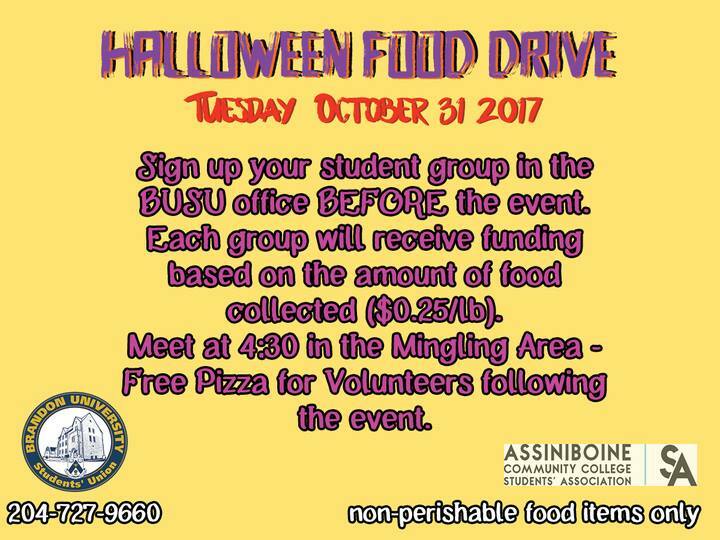 Halloween is just around the corner which means that the Brandon University Students’ Union and the Assiniboine Community College Students’ Association are gearing up for their yearly Halloween Food Drive. The Halloween Food Drive is when BUSU and ACCSA volunteers join forces and go door-to-door to collect non-perishable food items from across the city for their respective food banks. BUSU president Nick Brown explains that this isn’t the first year they’ve held the event. “It is a long-standing tradition. Between Brandon University and Assiniboine Community College, we split the city in half.” Brown goes on to explain that the food bank, which is located on the third floor of the KDC building, is an important resource for students to access. This event allows BUSU to adequately stock their food bank for the duration of the entire year. This year BUSU and ACCSA are having a friendly competition to see who can collect the most food on Halloween night! Brown explains that although everyone is welcome to participate they are pushing for BU student clubs to join in on the event. “We try to get clubs involved however we are totally happy to have anyone come out to the event. Last year we had tremendous success,” states Brown, adding that they collected over 4000 pounds of food for the BUSU food bank last year. In order to encourage clubs around the university to take part in the Halloween Food Drive, Brown says BUSU throws in an extra bonus for the club participants. For every pound of food collected by a club that club will be given $0.25 towards their operations. This year’s annual Halloween Food Drive will be taking place from 5:00PM to 9:00PM on Halloween night. Any student group or individual that is interested should either visit the BUSU office or phone 204-727-9660 to sign up. All volunteers should report to the mingling area on October 31st at 4:30PM to prepare for the food drive. Brown ends off by saying that there will be free pizza for all volunteers who partake in this year’s food drive following the collection.